Well, with my introduction to frozen yogurt having gone fairly well, I knew it would only be fair to give Ben & Jerry's a shot too. Being a chocolate and brownie addict, I decided to pick something appropriate. My favorite part? the brownie pieces ofcourse. The yogurt itself is also decent. It's not ice cream, but it's not some cheezy yogurt junk either. It not like any of us would expect low quality from B&J anyway. I think the Haagen-Dazs texture struck me as a bit more ice cream like, but I think that it's something that I'll sort out as I try a few more flavors and brands. I just wasn't really thinking about yogurt with H-D, but maybe the honey was distracting me. With B&J, there's no mistaking that you are eating yogurt. I'm not saying it's bad, I'm just saying it's not ice cream. On Second Scoop: Well, it's been a few months and I have tried many more frozen yogurts. With this in mind, I would now describe a fresh pint of this guy as ooey gooey brownies smushed into a fudgsicle. 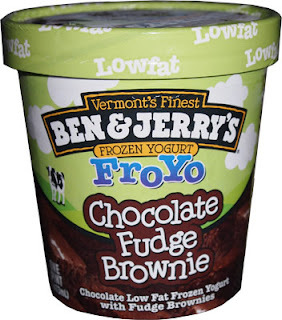 The brownies are excellent, but the froyo, while not having a yogurty taste to it, does have the consistency of frozen milk. Not sure how that works, but there's a good amount of brownies trying to distract you from that fact. Update: This flavor was RE-reviewed here.